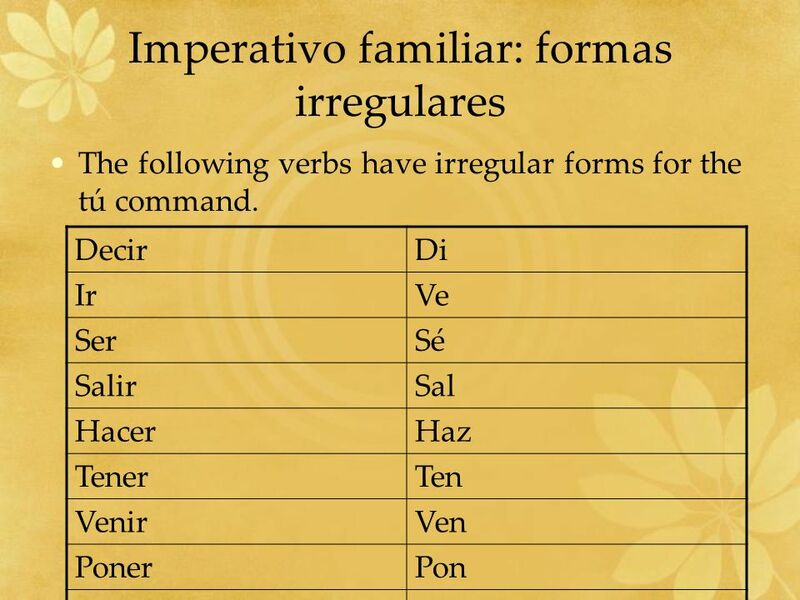 3 Repaso In Chapter 10 we learned the Imperativo Formal. To form the Ud. or Uds. 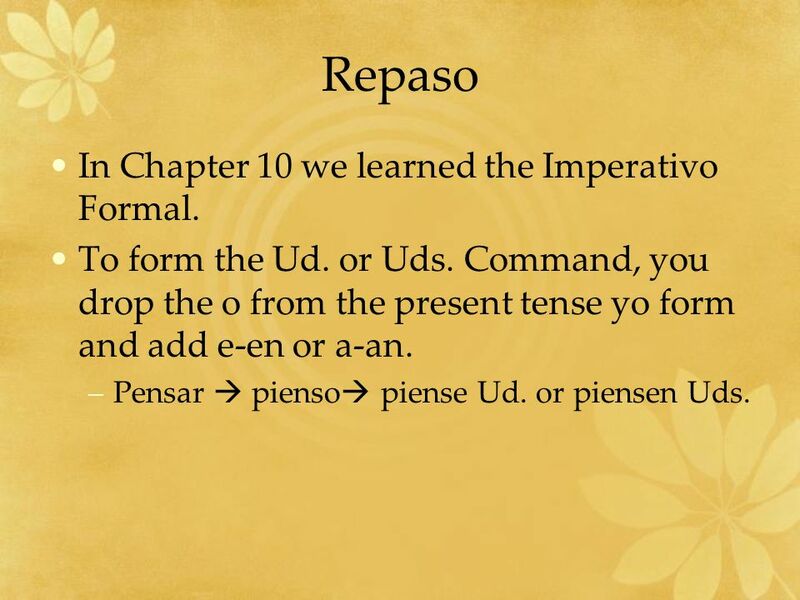 Command, you drop the o from the present tense yo form and add e-en or a-an. Pensar  pienso piense Ud. or piensen Uds. 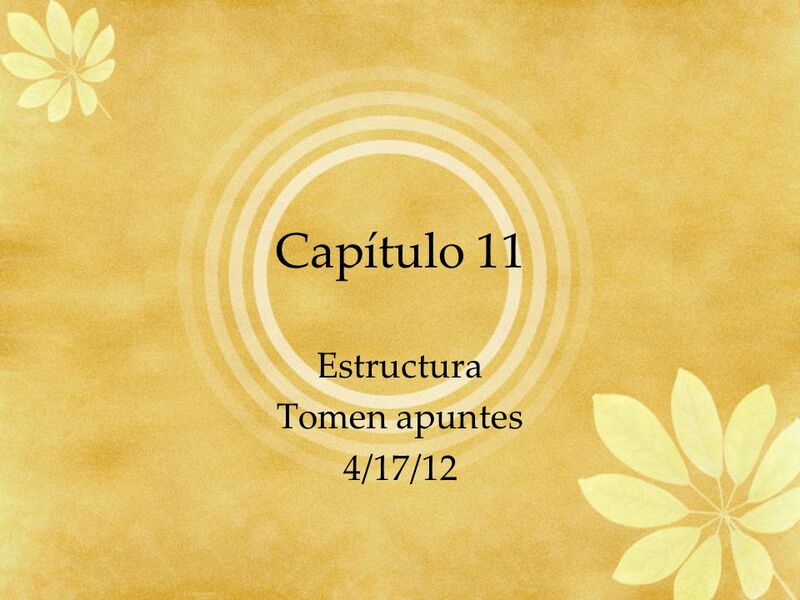 You use the tú command when speaking with friends, family, people you know well, and children. 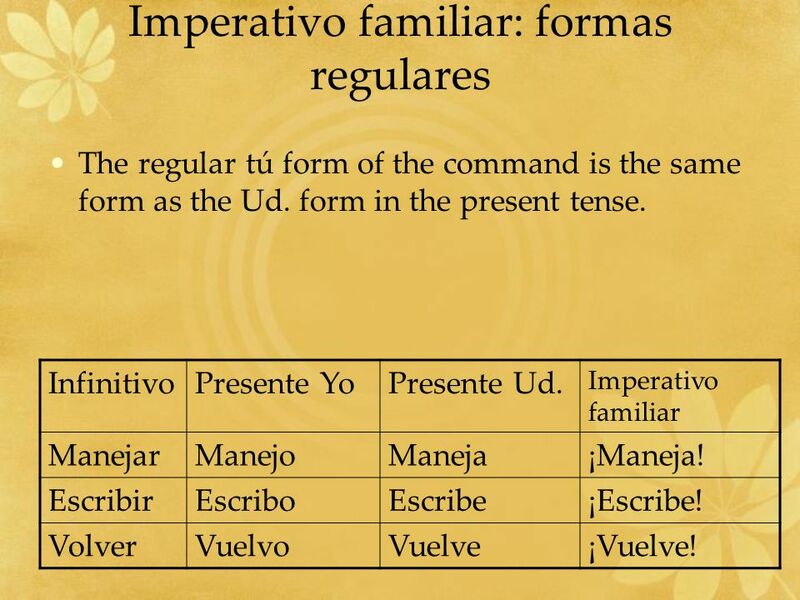 The regular tú form of the command is the same form as the Ud. form in the present tense. 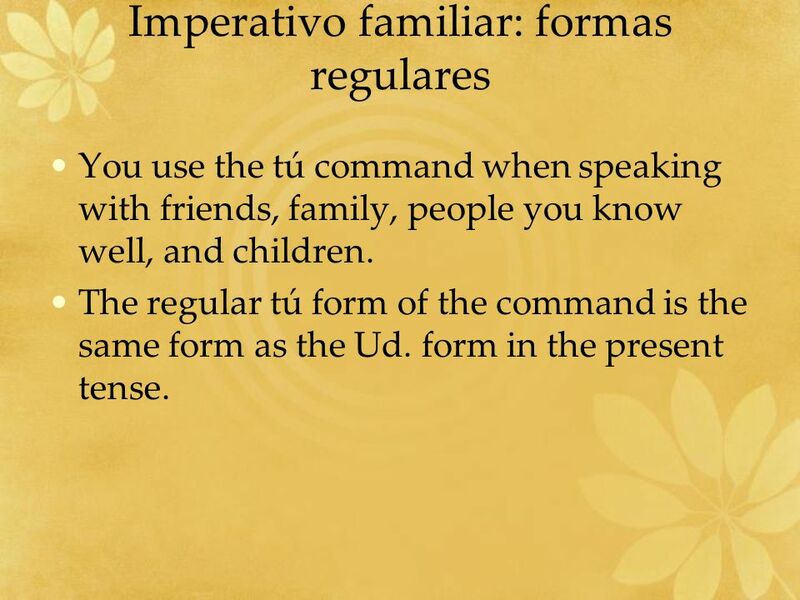 The regular tú form of the command is the same form as the Ud. form in the present tense. Infinitivo Presente Yo Presente Ud. Imperativo familiar Manejar Manejo Maneja ¡Maneja! 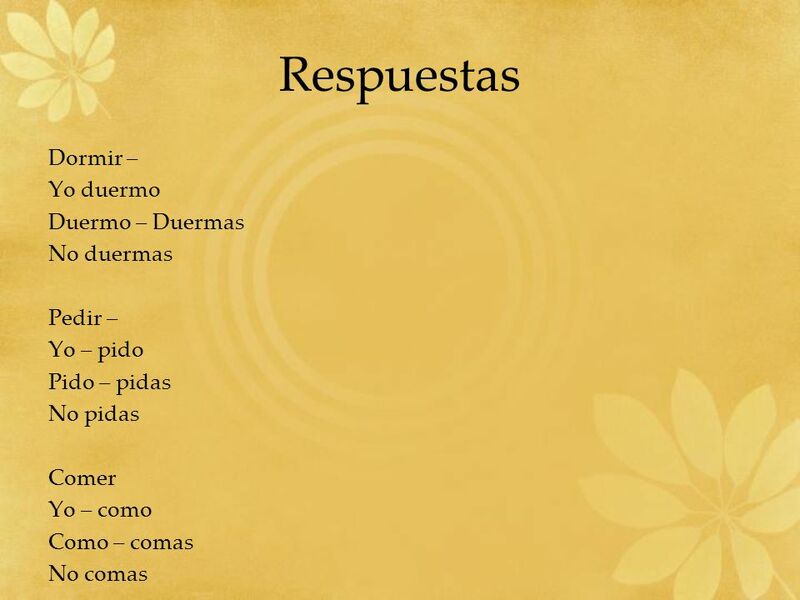 Escribir Escribo Escribe ¡Escribe! Volver Vuelvo Vuelve ¡Vuelve! 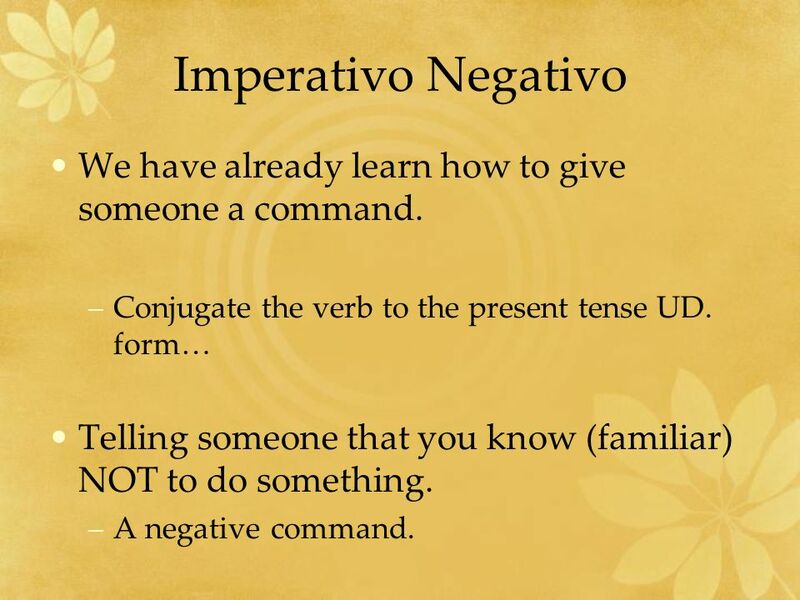 8 Imperativo Negativo We have already learn how to give someone a command. 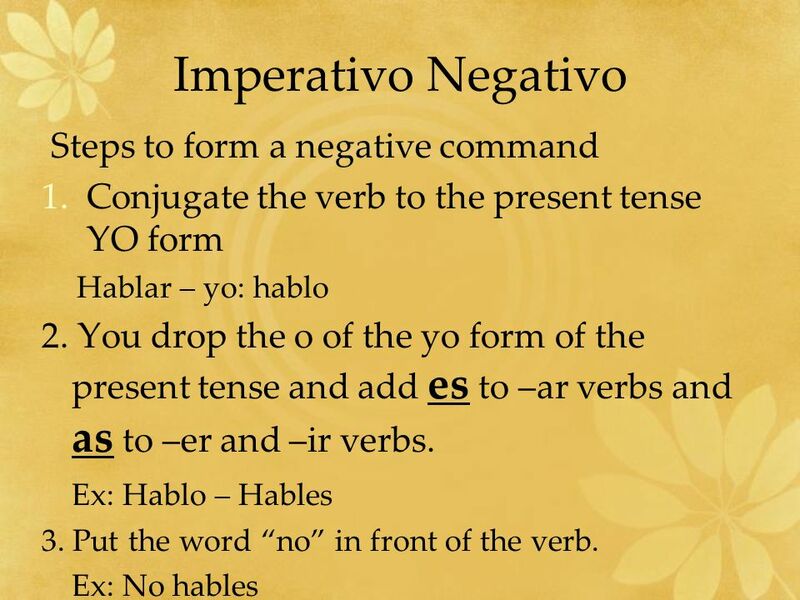 Conjugate the verb to the present tense UD. 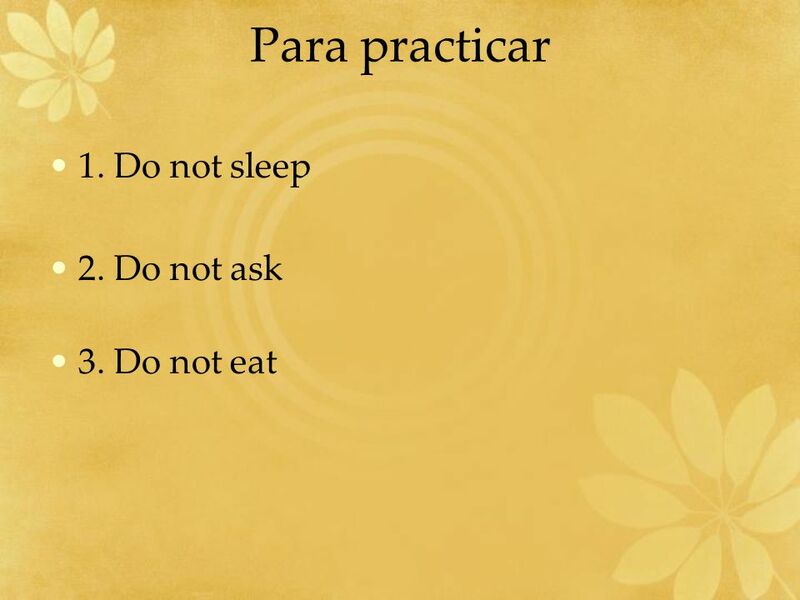 form… Telling someone that you know (familiar) NOT to do something. A negative command. 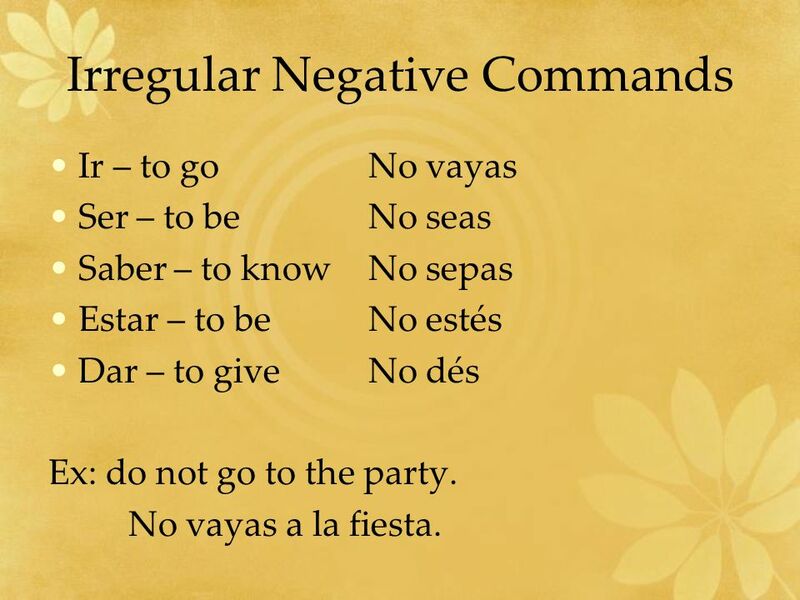 Ir – to go No vayas Ser – to be No seas Saber – to know No sepas Estar – to be No estés Dar – to give	No dés Ex: do not go to the party. No vayas a la fiesta. We studied pronouns in Chapter 9. 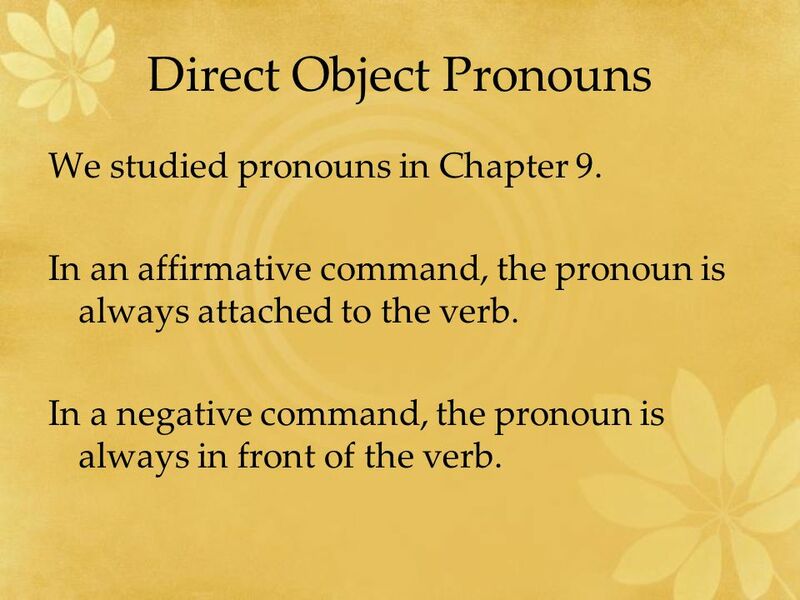 In an affirmative command, the pronoun is always attached to the verb. In a negative command, the pronoun is always in front of the verb. 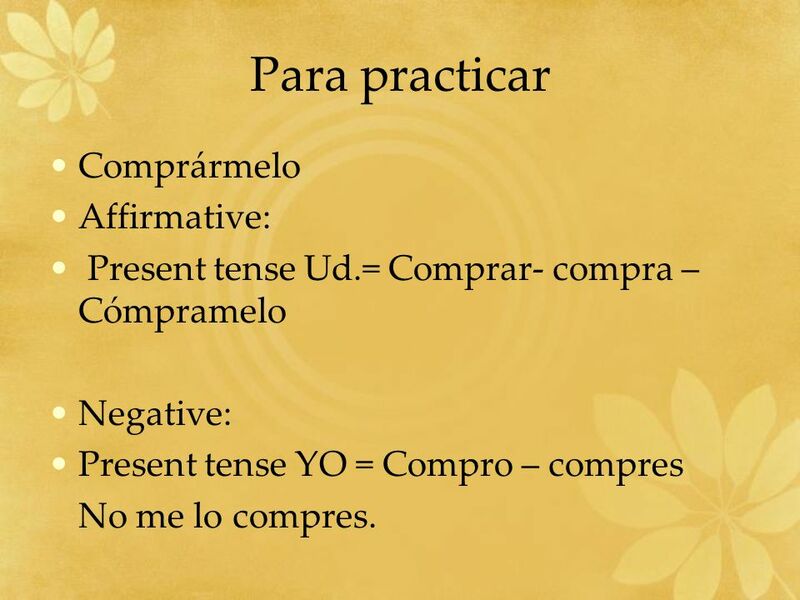 Present tense Ud.= Comprar- compra – Cómpramelo Negative: Present tense YO = Compro – compres No me lo compres. 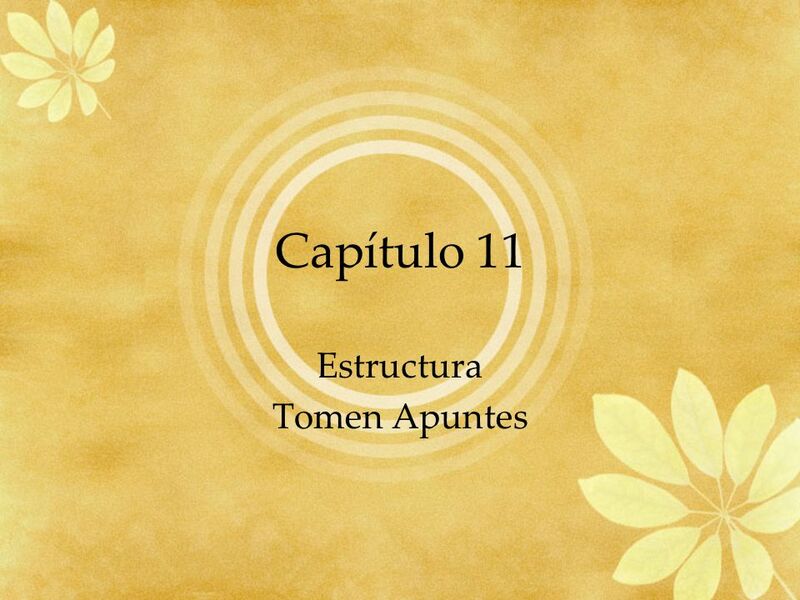 Download ppt "Estructura Tomen Apuntes"
Los Mandatos Informales ¿Cómo y cuándo lo usamos? El imperativo.  Used to give orders or to make requests.  In order to not sound rude or abrupt, intonation and attitude are important, as well as appropriate.